Any counting book that references The Bee Gees has to be good in my opinion. 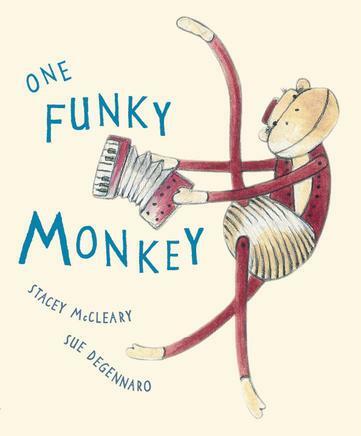 One Funky Monkey by Stacey McCleary and Sue DeGennaro dances its way through the numbers one to ten with a bunch of groovy animal friends along for the ride. The story begins with one funky monkey starting to dance. The other animals join in and soon there are ‘lion-dancing’ lions, ‘eagle-rocking’ eagles, reggaeing rhinos, moonwalking meerkats and hip-hopping elephants (who look surprisingly nimble on their feet!). By the end, all the animals have joined a conga line and little readers have the opportunity to count the animals again, one-by-one. The book is written in rhyme and the text is playful – “Nine disco dragons squawking and sliding, started ‘Jive Talkin’ and ‘Staying Alive’.” Whilst you might expect a riot of colour, the illustrations are in fact subtle but beautifully detailed. This is a terrific counting book for toddlers and pre-schoolers and will be much appreciated by kids who know their shuffle from a boot-scoot. One Funky Monkey is available from Fishpond for $26.97.